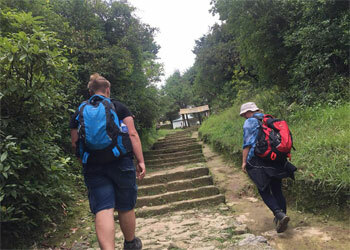 Nepal Easy Trekking trail is for the travelers who are aged or physical endurance, don’t have trekking experience before and got limited time in Nepal. So, if you are looking for few days of a short trek in the Himalayas, you will find some of the most popular short treks in Nepal. This trail offers the best time trekking season of Nepal Himalayan and popular trekking in Nepal. Nepal Easy trek does not take you to high altitude. It provides very nice opportunity to see the beautiful mountain of Nepal and a good introduction to Nepalese rural life and culture. In the shadows and foothill of icy pinnacles of the Himalayas, one passes picturesque charming villages inhabited by diverse ethnic groups. These treks are suitable for those busy people who want to have a Himalayan hiking experience during their short holiday or those who want to enjoy beautiful mountain sceneries in a leisurely walk with their friends or families. Similarly, it provides a great opportunity to experience Nepalese villages, green landscapes, and Himalayan snow-capped mountains. It is more of an easy hiking that unfolds before you can enchant hamlets tucked in the hills along with the panoramic views of the majestic Himalayan ranges, the rich flora and fauna of Nepal and the splendor of sunrise and sunset. the itinerary are short days but will offer you close to nature and authentic trekking experience. We “Above the Himalaya Trekking Pvt. Ltd” arrange our tour program with the intention of giving you a great time, and hope that you will have an unforgettable and exciting time, with memories of treasure for years to come.